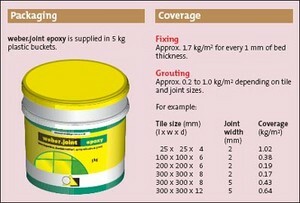 Weber.Joint Epoxy is a two-part, epoxy resin adhesive and grout that is suited to both interior and exterior use. It is also available in a selection of colours in order to suit a variety of tile designs. It can be used to grout ceramic tiles, porcelain tiles, mosaic tiles and quarry tiles and it can be used on floors and walls. This epoxy resin and grout is suited to grouting wall tiles and floor tiles that are located in spaces which require either chemical resistance or total impermeability. This means it can be used in a wide range of areas for both commercial and domestic premises. It is a great option for many food preparation buildings, toilets, swimming pools and bathrooms and even places such as hospitals and laboratories. Weber.Joint Epoxy is also appropriate for fixing tiles where certain requirements are essential such as toughness, high bond strength and flexibility. You can have ultimate confidence in this tile fixing product from Weber due to the fantastic qualities it has to offer. It is manufactured under BSI Quality Assurance Scheme ISO 9001 and it is really simple to use. With a choice of colours you can also customise your grout/tile combination allowing you to choose a practical option for a particular space. A long working time allows you to install your tiles with ultimate precision and this epoxy resin adhesive and grout gives you the flexibility and high bond strength you require. Because it is impermeable to fluids and resistant to chemicals, it is much easier to maintain, sterilise and clean. Repairing any voids or defects on the surface is a must in order to get the surface ready for the tiling process. Wire-brushing and washing down with water is also advised in order to leave a smooth, dry, clean surface. In order to achieve successful grouting you must allow the adhesive to fully cure/dry. For areas such as swimming pools the adhesive must be left for around 3 days before the grouting commences. Be sure to check that no loose cement, adhesive residue or debris remains – this will help to ensure the best results. Some matt tiles and unglazed tiles may be susceptible to some surface staining; in some cases testing on a spare tile beforehand can be useful. Remove any excess product before it hardens, as epoxy resins can be tough to remove once cured. The hardener component, which is found in the lid, needs to be added to the resin component, located in the base. These should be mixed together thoroughly until a uniform colour is achieved with a good consistency. A slow speed mechanical mixer is recommended and you should not add water or part mix. Using a jagged trowel (which you can find in our tiling tools and accessories section) apply the adhesive directly onto the surface, covering around one metre squared – as this will give you enough to work with within around 20 minutes. Firmly bed the tiles into the adhesive using a gentle twisting action. You can even double check that a solid bed of adhesive is being achieved by removing a tile every now and again. One applied, leave the tiles to set for around 24 hours before grouting commences. The grout needs to be worked into the joints and it should only be applied to a small area at a time. Confirm that the joints are free of voids and filled completely. The use of a damp emulsifying pad helps to clean the face of the tiles and emulsifies the grout surface, before it begins to set. A damp sponge can be used to wipe clean the surface – and ensuring that you correctly finish the grout helps to leave a smooth, easy to clean surface. Weber.Joint Epoxy should not be used where the temperature is below, or likely to fall below, 10°C during both application and curing. Store this product airtight in a dry, cool place that is protected from frost. The shelf life of this tile fixing product is 12 months from the date of manufacture.